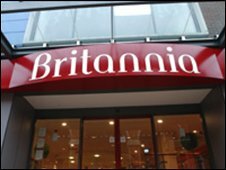 The Britannia Building Society has confirmed it is in talks with Co-operative Financial Services (CFS) that may lead to a merger. Such a merger would depend on the passage of legal changes which are currently in the committee stage in the House of Commons. Britannia is Britain's second biggest building society and is based at Leek in Staffordshire. CFS includes Co-operative Bank, Smile and Co-operative Insurance. The Building Societies (Funding) and Mutual Societies (Transfers) Act, known as the Butterfill Bill after its sponsor Sir John Butterfill MP, would give building societies greater freedom to merge with other companies as well as changing the current restrictions on the way they are allowed to raise money. A combination of the two would have about six million members and £70bn worth of assets, according to Britannia. Britannia's chief executive Neville Richardson stressed that the talks were at an early stage. "It's too soon to talk about what changes might arise for our customers and employees," he said. But he added that, "We remain committed to our Leek, Staffordshire base". Both parties said they were in a strong financial position and that the talks were part of their plans for growth.